Low-Carb Slow Cooker Sweet and Sour Pot Roast will always be a hit when you need some winter comfort food. This pot roast is also low-glycemic, dairy-free, gluten-free, South Beach Diet Phase One, and can easily be Paleo 30 if you use approved ingredients. Use the Diet-Type Index to find more recipes like this one. 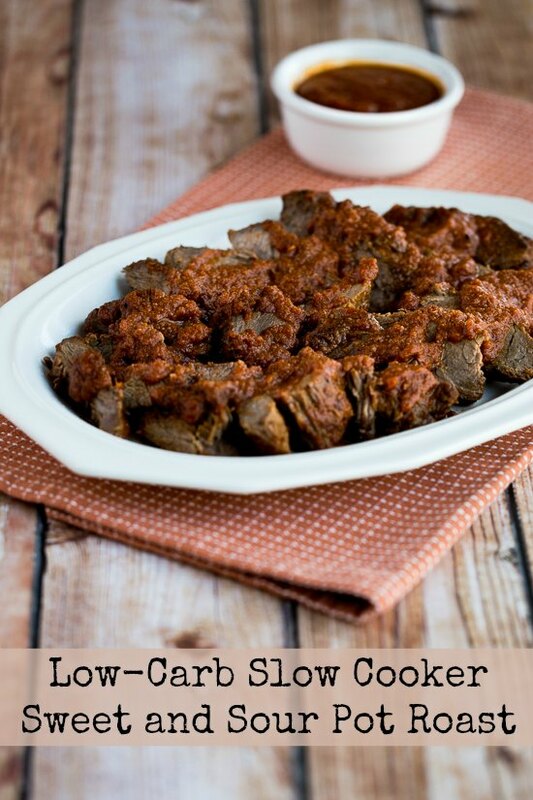 Click here to PIN Low-Carb Slow Cooker Sweet and Sour Pot Roast. Yesterday we had the first snow of the year at my house, so besides thinking about Carb-Conscious Thanksgiving Recipes, I guess it’s also time to think about low-carb comfort food that helps keep you warm. This delicious Low-Carb Slow Cooker Sweet and Sour Pot Roast is a recipe that fits that description for me, and I’ve made this often since I first posted the recipe back in 2007. And although I really, really, really hate winter weather, I do love cold weather food! I’m sure I don’t have to tell anyone that sticking to a carb-conscious eating plan is much more challenging during the holidays, and one thing that really helps me is to make recipes on the weekend that Can Freeze, divide the leftovers out into containers with one or two servings, and stash them in my diet friendly freezer so I have plenty of easy low-carb options when I need dinner but don’t want to cook. This Low-Carb Slow Cooker Sweet and Sour Pot Roast freezes beautifully, and I’ve already had the leftovers once for a quick dinner! Check out Weekend Food Prep for more recipes that are good to make ahead and eat later! Trim the chuck steak so most visible fat is removed; you’ll probably have to cut it into pieces to do that. (I save the scraps to make beef stock.) Rub the pieces of meat with steak seasoning; then brown on all sides. (For best flavor, don’t skip this step of browning the meat.) Put the browned meat into the slow cooker. 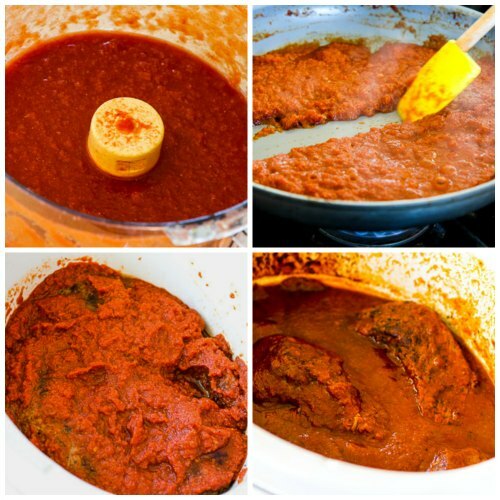 While the meat browns, puree the sauce ingredients, then cook it in a frying pan until it thickens. It should be thick enough that you can scrape the bottom and the sauce stays together like you see in this photo. Cover the meat with the sauce and cook on low for 7-8 hours (or a little longer won’t hurt) or on high for 3-4 hours. Low-Carb Slow Cooker Sweet and Sour Pot Roast will always be a hit when you need some winter comfort food. Heat olive oil in a large frying pan and brown roast well on both sides. This will take a few minutes; don’t rush the browning step. Put browned roast into slow cooker. Deglaze the pan while meat browns, combine onion powder, garlic powder, ginger puree, Stevia in the Raw granulated (or sweetener of your choice), rice vinegar, tomatoes, soy sauce, and anchovy paste (if using) in food processor. Process several minutes with steel blade until tomatoes are pureed and ingredients are well combined. Put the pureed sauce into the frying pan where you browned the meat and simmer on low heat until the sauce thickens; you should be able to draw a spoon through it and have the sauce stay together like shown in the photo. Once it’s thickened to that point, pour sauce mixture over the meat in the slow cooker. Cook on low 7-8 hours (or more) or on high for 3-4 hours, or until meat is very tender. (If I’m home I usually turn it a couple of times, but it’s not necessary.) Remove meat from slow cooker and keep warm. Skim off any visible fat from sauce mixture if needed, or use a fat separator. Slice the pieces of roast as needed and serve hot, with sauce spooned over meat. I used a Crock-Pot 3-1/2-Quart Slow Cooker for this recipe. The recipe Can Freeze, so if you only have a bigger slow cooker I’d double it and stockpile some in the freezer for quick dinners later. 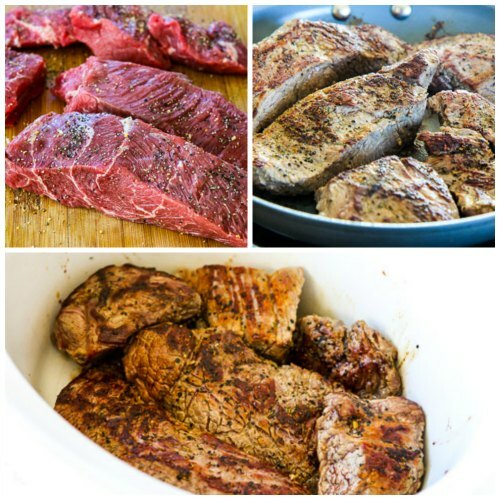 I used my homemade Montreal Steak Seasoning; use an approved seasoning for Paleo or Whole 30. 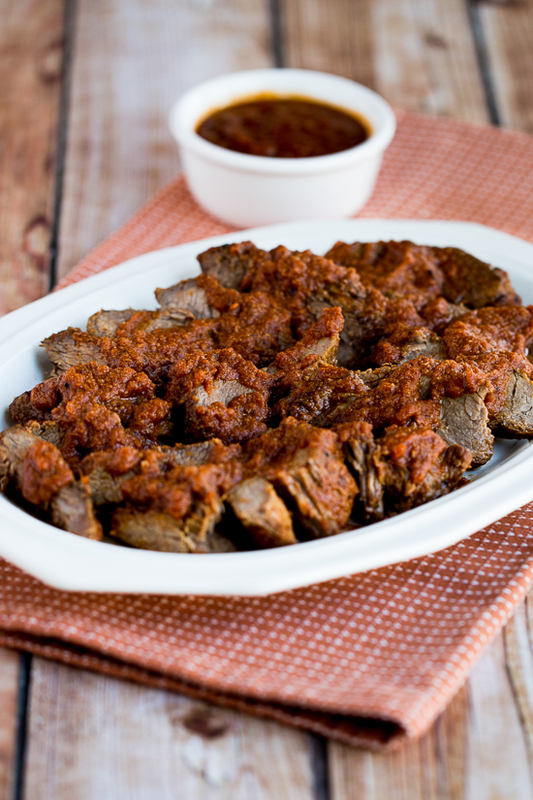 Some ideas for the sauce came from a recipe for Ginger Beef in 500 Low-Carb Recipes. You might want to read How to Make Pot Roast in the Crockpot before you make this recipe. Use the Recipes by Diet Type photo index pages to find more recipes suitable for a specific eating plan. You might also like to Follow Kalyn’s Kitchen on Pinterest to see all the good recipes I’m sharing there. Click for more Slow Cooker / Pressure Cooker Recipes on my other site! This recipe is a staple in our home since we found it quite a while back. My absolute favorite! Glad you have enjoyed it! Thanks, Kalyn – this was delicious! I didn't let the sauce reduce enough, so it was a little runnier than your photos. Next time, more patience! Thanks for great sounding recipe. do you mean ginger powder or a liquid puree? I have only made it with the ground ginger root that comes in a jar, sometimes called ginger puree and sometimes called ground ginger. I don't know how dried ginger would be as a substitute, but it might work in a recipe like this. If you try that I'd love to hear what you think. Such a unique change from normal pot roast! LOVE it! Pot roast is not common in my country, but this one look interesting. Got to try it sometimes. When I first got a slow cooker, I followed your directions for making pot roast as one of my early experiments. Never fails to produce great pot roast. Thanks for linking to one of my own pot roast recipes. Lydia, that must have been a LONG time ago, because you're an expert now. I don't have experience cooking lamb in the slow cooker but I can't think of any reason why it wouldn't work. Would love to hear what you think if you try it. Do you think you could make this with lamb? I have some leftover, rare grilled lamb that I am looking for a crockpot recipe to use it in. Kalyn that sauce looks and sounds incredible! I simply don't make pot roast enough (like, never). You make it look so good! Elizabeth, so glad that worked for you! Thanks for the suggestion. I think I added 1/2 T and it turned out great. Everybody loved it and I have leftovers – Yahoo! IPhone so quick reply. I think 1 T sounds like a lot of salt. Can add more later. I love your website. I have so many allergies and candida that your's is the only one with lots of options – and very tasty too! I'm planning on these subsitutions, do you have other ideas? Apple cidar vinegar for the rice vinegar – although I like the idea of 3 T vinegar and 1T water. I have to avoid soy, wheat, yeast and corn as well as sugar. Rice vinegar is a type of mild Asian vinegar. It's sold by the Asian foods, it's not expensive, and you can find it in any grocery store. If you don't want to use it I would substitute 3 T white vinegar mixed with 1 T water. What is rice vinegar? Are there other options to substitute for this? Virginia Bluebell, so glad to hear you enjoyed it! Kalyn, I made this the other night and it was wonderful. I have to confess I hesitated at first: tomatoes and ginger? But, I trusted you and as always, you knew what you were talking about! I actually didn't have the can of tomatoes on hand, so I used a 6-oz. can of tomato paste and about 4 or 5 oz. of water instead. Really delicious! So glad to hear you liked it. Just letting ya know that I gave it a try and it had a really great zip to it. Love the change from the way I usually make it – thanks for another great recipe! Tanna, I think this is going to be one of my favorite pot roast recipes. MW, the idea of shallots sounds great. Naudee, thanks for all your great feedback. mmm…pot roast – looks Dee-lish! I love to eat it…now, I just need to try and make it! How do you manage to always make it looks so wonderful! A good pot roast is always welcome. JMom, aren’t those Costco roasts great. I love Costco! Kristen, this was a bit unusual for post roast, but really good. We make pot roasts all the time, but it seems like I’m always doing it the exact same way. Thanks for sharing this recipe! I get those roasts from Costco too! So now I have another way of fixing them from the usual pot roast I usually make 🙂 Your photos look delish!